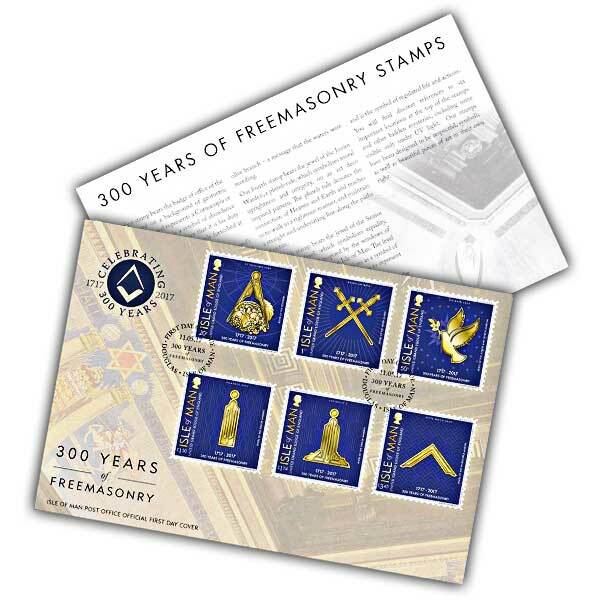 Isle of Man Post Office is honoured to provide this set of six stamps marking 3 century of the United Grand Lodge of England and English Freemasonry. Freemasonry is a 'system of morality, veiled in allegory and illustrated by symbols'. 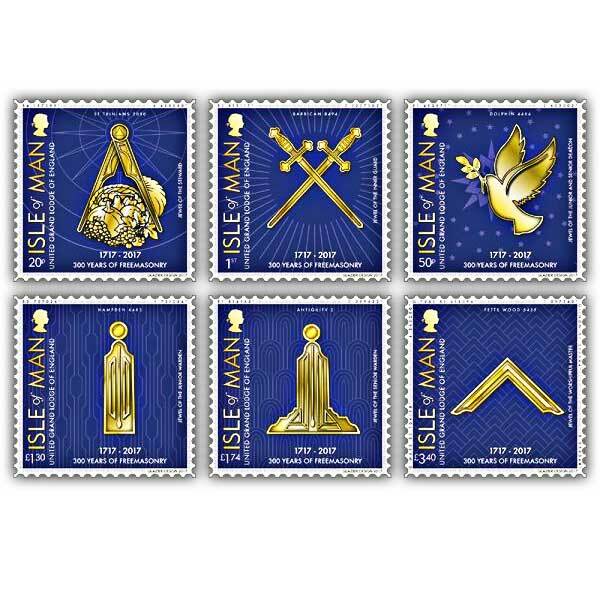 This formed the motivation for the stamps which feature the badges of office of the senior offices within the lodge, abstract architectural components from the lodges of England and the Isle of Man and discreet signs commemorating the tercentenary, along with the 50th year of office of His Royal Highness The Duke of Kent, Grand Master of the United Grand Lodge of England (UGLE). Each stamp will include a subtle ribbon with the characters HRHDOKGM50 in the border of the stamp and the official logo of the UGLE tercentenary which is only visible under ultra-violet light. This luxurious first day cover beautifully displays a full set of the 300 Years of Freemasonry stamps cancelled for the first day of issue. Each stamp includes a badge of office for senior officers within the lodge. There are extra discreet referrals to six crucial places at the top of the stamps and other hidden secrets, including some noticeable just under UV light. Very well done product. Excellent product for the price. A great item for a fellow Mason.